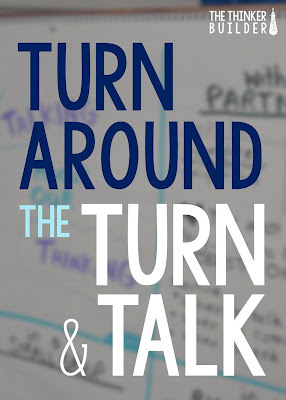 A turn-and-talk is a structure to get students talking to a partner for a few moments. 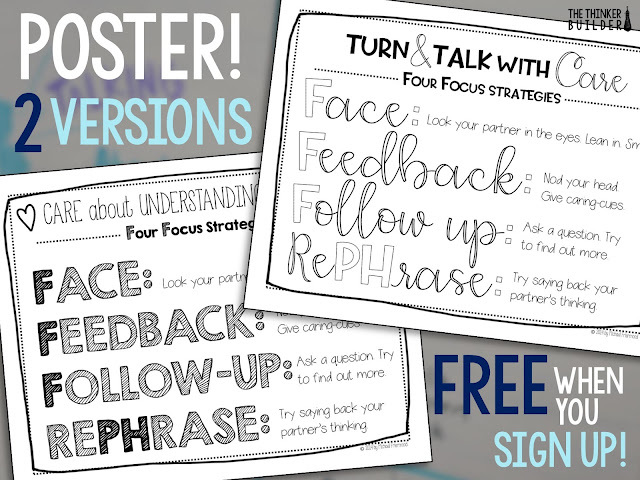 I use turn-and-talks a lot during whole group instruction, especially reading, because it allows for more communicating than me just calling on particular students. Often though, I feel like my students' turn-and- talks are more like: turn-and-make-noise. Even though students are paired with a partner, it seems like each person is only wrapped up in his/her own thinking and ideas. And it all just comes spewing out at the same time. Is this what I was looking for? Is there any real communication going on? Are students understanding what their partners are saying? Do they even care? This year I decided to take a different approach to a turn-and-talk. I still loved its simple format, but I wanted a more authentic conversation to happen between students, so I'm trying to "turn around" a turn-and-talk so the focus is not on the talking, but on the understanding. 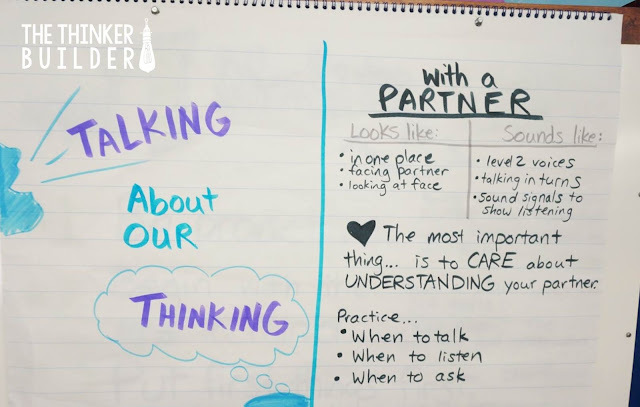 The chart above is what I built with students to try to switch our priority to caring about understanding our partner, rather than simply sharing our own thoughts. And wouldn't you know it, a byproduct of this new mindset is that students still get to speak their own thoughts, because their partners care about understanding them. FACE: Look your partner in the eyes. Lean in. Smile. FEEDBACK: Nod your head. Give caring-cues like, "Mmm-hmm," or, "Really?" FOLLOW-UP: Ask a question to find out more and make things clearer. 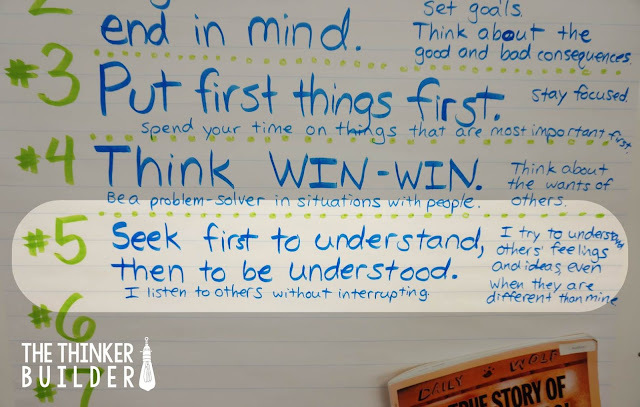 REPHRASE: Try saying back your partner's thinking: "So I think what you're saying is..."
As a parallel side note, we are also introducing the 7 Habits of Happy Kids, and Habit #5 is just a perfect fit with what we've been talking about. I made the poster below to display to help my kids focus on what's really important when we do our turn-and-talks. There are even two versions! Sign up for my newsletter below and get the posters for FREE! 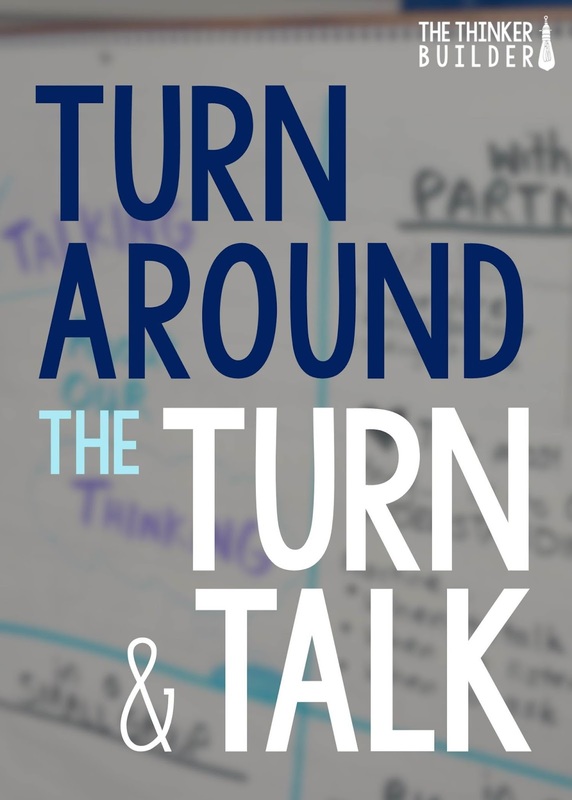 Though it takes a little time to model and teach, turning around the turn-and-talk has made a big difference!